Diwali has the significance of the victory of good over evil; and it is with each Diwali and the lights that illuminate our homes and hearts, that this simple truth finds new reason and hope. From darkness unto light, the light that empowers us to commit ourselves to good deeds, that which brings us closer to divinity. At AIMU we celebrated Diwali with lights to illuminate life and the scent of innocence in the air, mingled with the sounds joy, togetherness and hope. The students and faculties of AIMU gathered on this auspicious day for joyous celebration as a mark of celebration of life, its enjoyment and goodness. On Sunday, October 30th 2016 AIMU celebrated Diawali at its St. Lucia campus. Diwali is touted as a festival of lights; however, colors play a colorful role in this festival. AIMU- Diwali evening started with display of colors as RANGOLI. The colors and diyas of these stunning rangoli designs were illuminating the floors of AIMU displaying the talent of the medical students at AIMU. AIMU-Diwali evening was packed with entertainments by its students organized at the campus auditorium. The experience an extraordinary night started with lighting lamps by Dr. Satyajit Patra commemorating the victory of light over darkness followed by devotional prayers by Ms. R.P.Chueliydao and Ms. Abirami Sree. The event followed with loads of entertainment from students exhibiting their talents in singing, dancing, fashion shows to list a few. Mr. Selvin and Mr. Satish were outstanding in their ability of singing to mesmerize the students and shared the first prize for the singing competition. In the Dance completion, various forms of dance were showcased by the students including Classical, Bollywood and so on. Ms. Sini was astonishing to captivate the audience with her dance moves and received a special appreciation award. Ms. Reshika, Chueliydao and Abirami Sree were enthralling and won the first prize for the dance competition. Best costume prize to recognize the best traditional wear by the students were won by Ms. Manaswini and Mr. Santosh. Firecrackers are an integral part of Diwali celebrations, and in AIMU-Diwali event students celebrated this night by lighting sparkles. Lighting sky lanterns and watching it flying it high on the Caribbean sky was an immense pleasure. 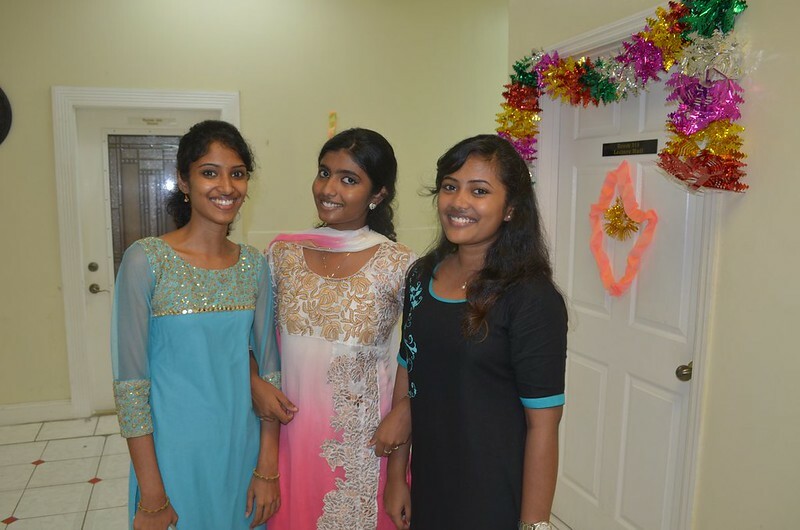 The night loaded with entertainment, joy, happiness was continued with special Indian dinner and deserts made and served at the AIMU-cafeteria.